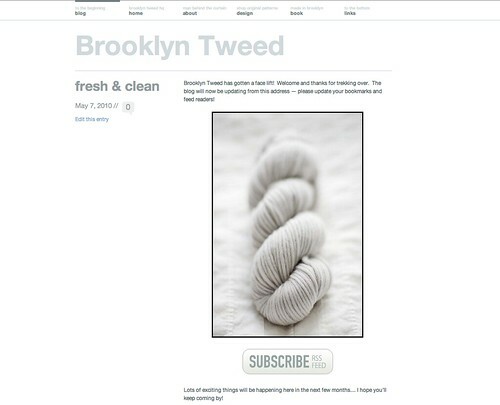 Brooklyn Tweed is moving to a clean, fresh space -- one that is integrated into the structure of the rest of my website. Please stop by and check out my new digs and be sure to update your bookmarks, feed readers, etc! The Exquisite Corpse is a collaborative process in which multiple artists create a single image (typically the human figure) in sequence with one another. Each artist is permitted only a glimpse at the contribution of the previous artist without knowing its connection to the whole. The imaginative drawings that are created in this way are spontaneous, random, and very interesting. With this process in mind came the spark of an idea for a design experiment that resulted in the sweater you see photographed here. I got in contact with a few of my favorite indie-designers to see if they were up for a design challenge: to create a collaborative garment in random sequence working directly off of the piece or pieces that were presented to them from the previous designer. Starting with a general set of garment dimensions provided by me (so that the garment would fit the body at the conclusion of the process) each designer was given complete creative freedom for their portion of the sweater. I chose a bulky, rustic sheepswool in hopes that the materials would inspire textural experimentation and highlight the multi-directional quality of the fabrics. As you can see from the images, the garment is a veritable explosion of texture! The designers who collaborated on this project, each from a different location around the country, were: Connie Chang Chinchio, Tanis Gray, Carrie Hoge, Melissa LaBarre & Elli Stubenrauch. Below is a schematic of the finished garment, a Dolman cardigan, and how each designers contribution comes together to create the finished whole. It was a wonderful experiment and created a garment that I find interesting for so many reasons. 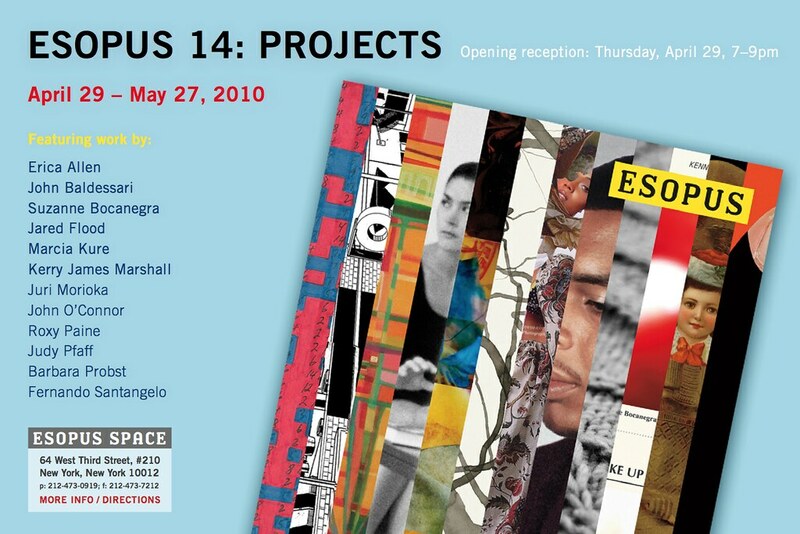 The magazine is accompanied by a gallery show in which all pieces from the current issue are on view at the ESOPUS space in New York. For those readers who are local, click here for the show information if you'd like to see the physical garment on view at the gallery. I want to give a special thank you to all the designers who joined me to put this together as well as my lovely model (does she look familiar? Yes, that's famed Cookie A. looking fierce). The garment is a true one-of-a-kind and the result of each designers immediate response to the garment pieces as they were presented to them. I hope you enjoy it! I'm so happy to share with you a new lace design that was published this week -- I've been itching to show you photos ever since I finished it in January. I designed this lace triangle for Veronik's second issue of St. Denis Magazine and got another chance to use her lovely wool Nordique. Because the triangle is knit flat (back and forth) and patterned on both sides, it requires a bit more concentration than your average lace project and does involve getting familiar with directional decreasing from the Wrong Side (Slip, Slip, Purl & Purl 2 Together), but if you're up for a challenge this one is for you! The magazine is a wonderful issue and full of designs from some of my favorite designers -- be sure to check out some of the other patterns from this issue on Ravelry here. To look up project details just for the Juneberry Triangle, click here. Veronik has also already knit a stunning version of the same pattern in her new, lighter-weight yarn Boreale that is fantastic! How wonderful it is to knit lace in a variety of different gauges and yarn constructions. The Nordique version is warm and woolly with a more substantial 'fabric' feel. From what I can tell of the ice blue Boreal version, it's delicate, feather-light lace at its finest! Juneberry continues my nostalgic fascination with bobbles... this was an experimentation in bobble-laden lace patterns and has a very berry-like texture as a result. I think it feels sophisticated while remaining fun and playful at the same time. I hope you enjoy it! Shortly after returning from vacation, I completed work on this simple handspun triangle. Since I was shooting to use up every last bit of this special yarn, I waited until I was home again and armed with my trusty kitchen scale to aid in calculations so that every last yard could be enjoyed, stress-free. It's probably no surprise to anyone, but a simple shape of fabric with a good wool and suitable texture is a recipe for success every single time in my book. Simple knitting allows for the enjoyment of the special characteristics of our materials and I think this might just be one of the things that keeps me devoted to my knitting. One of the many things. This piece was worked in the standard method, starting with just 10 stitches at center-top and increased regular along both edges as well as the center 'spine' to create a simple triangle. I love working from the top down (from the top 'out' seems more appropriate in this case) when you know you have limited yardage and want to stay in control of your process. By working with with a scale and measuring the remaining grams of unworked yarn remaining, you have good solid numbers telling you when you need to start thinking about binding off. This scenario is almost always better to me than spending the last 20% of the project wondering if there will be enough yarn to get me across the finish line. The simple stitch pattern is a subtle variation of garter stitch -- knitting, knitting, knitting, and purling every 6th row (or every 3rd RS row) to create a 'valley' in place of every third Garter Stitch Ridge. I think this stitch pattern is beautiful in its simplicity and highlights the diagonal directional fabric in a sweet way. I kept the first and last 3 stitches of each row (the stitches running along the top, flat edge of the triangle) in pure Garter Stitch and ended with 3 consecutive ridges to give a touch of weight to the outer edge of the shape. I estimate that I used approximately 275 yards of a very light, handspun 2-ply yarn, the weight of which danced around between a DK-weight and a light-worsted weight, as handspun yarns tend to do. I loved the lightness of this yarn and wanted to play that up by knitting it at a looser-than-average gauge and block the finished piece as for lace. The result is a feather-light fabric that is toasty-warm and wooly-soft. Surprisingly soft for a Romney, but that has a lot to do with the amount of air that is trapped in the finished yarn. The finished dimensions of the piece came out to about 43 inches across the top, flat length of the triangle, and a 21 inch depth at the center 'spine'. Perfect size for a wool-lovers alternative to a bandana, no? I don't know if I'll ever stop singing the praises of blocking wires -- their precision in making perfectly symmetrical shapes while blocking brings me an unlimited amount of satisfaction. They really play to my inner Geometer. To maximize the blocking potential, I worked a sewn bind-off for as much added elasticity as possible. Traditional bind-offs, when worked along the perimeter of larger pieces that will be blocked severely is a recipe for disaster. The sewn bind off, while taking a bit longer to execute is so absolutely worth the fuss. Wool-wearing weather is beginning to slowly retreat, but at least this little triangle will provide a graceful (desperate) transition before the official hibernation of my cold-weather wardrobe. I've spent a lot of time over the last two months giving the patterns in Made in Brooklyn a complete make over for their release as individual PDF downloads. I'm very happy with the result, and even happier to announce that they are all now available both through my Ravelry store as well as BrooklynTweed proper. One of the most beautiful things about PDF downloads is that there are no page restrictions. Thanks to my rather verbose style of writing patterns, I really pushed the limit on my page-count when writing the print-version of the book, which ended up significantly affecting the size of the charts which was, while understandable, a real bummer. That said, the biggest change to the patterns is definitely chart size and clarity -- in most cases they have been re-illustrated and blown up to have their own, spacious page to spread out on. The texts have also been given more breathing room and in some cases have been extended. Each pattern begins with a Pattern Blueprint page which lists all the specifics about the garment and needed materials and includes an alternate photograph as well as a large, clear schematic. I worked closely with a tech editor for all the new layouts and corrected any existing errata that was present in the 1st edition of the print version. I hope you enjoy them and thank you so much, as always, for your continued support! Social Media: I finally got around to setting up a Facebook page (took long enough, right?) -- please feel free to stop by or to become a fan if you're a Facebook user. I plan on using it as an alternate way of posting my teaching schedule and teaching-related announcements (Dates are also always posted on my website), as well as other informal announcements, snapshots, etc. And if that isn't enough social media for you, you can also catch Brooklyn Tweets (sorry, I had to) on Twitter here, if you're into that sort of thing. Pattern Wholesale: In the last 6 months I've been wholesaling many of my designs to Local Yarn Shops. If you are a shop owner and interested in wholesaling print patterns, please send me an e-mail and I'll be happy to put you in contact with my distributor. Phew! I think that's all the housecleaning for the day... although I'll expand this post if I realize there is anything that I've forgotten, which there most likely will be. I travel a lot, but rarely for the express purpose of vacationing. My considerations for travel-knitting, in general, are designs that are in-process works that are at a point where a significant amount of mindless, or at least not-difficult-to-record knitting is in store. This way, I get 'work' knitting done without having to sit in front of Illustrator or InDesign, activities which I prefer to do only on the Homefront. So, when a true Vacation came along I thought my travel knitting should reflect this change, and I decided to bring simple, 100% pleasure-knitting that required no pattern, no notes, and very little brainwork. I wanted projects that were geared towards my hands and allowed enjoyment of the simple act of knitting. And oh how wonderful it was! I took small amounts of two special yarns that were both worthy of a special occasion. First, one beautiful skein of Buffalo Gals Yarn -- a very special 2-ply Bison/Merino yarn, hand-dyed by Fiber Sage Judith MacKenzie McCuin -- which I was fortunate enough to acquire directly from the source (Judith's hands) and have been savoring ever since. The other, my recently spun Romney 2-Ply, which is as light as a feather and wonderfully woolly. Armed with one beautiful skein, I threw a prized set of Ebony needles into my luggage and started thinking of the possibilities for something luxurious and simple. A feast for the fingers! I ended up deciding to knit a top-down hat in a simple waffle-stitch pattern. The yarn is a sport weight and creates a beautiful, light-weight and butter-soft fabric. A perfect companion for being in the passenger seat of a car for miles of Italian Autostrade. Alternatively, the skein of Romney created just enough variety to keep me constantly entertained, bouncing between two projects from day to day. For this, I began work on a simple, almost-garter-stitch triangle. Because I had limited amounts of both yarns, I decided to work both projects from the top down (in the triangle's case, from top-center, opposite of Triangle Tip) and work mindlessly until I used up all of my yarn. I love working in this way -- armed with a simple kitchen scale, you can always be sure of using as many yards as is possible without having to spend the last 20% of your knitting time biting your nails, wondering if you'll have enough yarn to finish. I didn't complete either project on my trip, which was a good lesson toward learning that I often need less yarn than I think I will while on the road. I have, since being home, just about finished both projects with very satisfying results. Also, upon return, I was stricken by an incredible urge to have some Unspun Icelandic yarn back in my life (this is what happened the last time), and ordered yarn for a new lace project in this lovely stuff. It reminds me of a chocolate layer cake. Unspun Icelandic Wool ranks high on my list of favorite yarns, largely because it is so unique and unlike anything else out there for knitters. The majority of the yarn is air, after all! So, it turns out that I ended up learn something important from vacationing -- keeping it simple, even though my instincts were screaming to bring more yarn, was absolutely the perfect choice for enjoying knitting every day and savoring every stitch of these special yarns. I'm home after a wonderful week of adventures -- simple knitting projects, simple foods, and many a click on the old odometer (people drive fast in Italy) -- oh what fun! I took the opportunity of being in the middle of such a visually rich country (texture, texture everywhere) to shoot some new accessory patterns that I've been working on this Winter. I'm happy to introduce Dryad -- which has become an instant wardrobe luxury around BT headquarters, even despite the slow thaw that brings Spring. In the Fall I found myself frequently experiencing the urge for a serious cabled scarf -- one that pulls out all the stops and doesn't apologize for being dramatic. I wanted something wide and long, with big, plump cables that still retained a non-oppressive weight and elegant drape. As is usually the case, finding the right yarn for the job was the key to solidifying design, and made all of the above listed requirements possible. The scarf is knit with Blackstone Tweed, new from Berocco last Fall, a yarn that is special and unique and in my opinion stands out among the commercially available tweeds. Blackstone Tweed has a rustic look, but a surprising drape and hand, due in part to its interesting fiber composition (Wool, Superkid Mohair, Angora). Don't be fooled though, this is not your average mohair/angora sneezy fuzzfest. The yarn is prepared with minimal halo and a lightly spun, crisp hand. The touch of angora (just 10%) adds amazing softness and really makes this a luxurious material. The drape that can be achieved, even in heavily cabled fabric is something definitely worth taking a second look at! All that said, it makes a perfect fit for a scarf that may otherwise be overly heavy or rigid. Even with 6-stitch cables, which begin to be voluptuously plump, the fabric still drapes and moves beautifully, and is quite visually appealing as well. A great color palette doesn't hurt either. Back to my ever-present desire to be swathed in cables: this one definitely fits the bill. In general, I usually wait to absorb a new piece of knitting into regular wardrobe rotation until the pattern is written and the photo shoot complete... not only as a way to keep the work fresh for its close-up, but also to trick myself into getting the work done faster. This scarf has been burning a hole in my pile of finished knitting and I'll be honest that I've been wrapped up in it ever since we wrapped the shoot. Even indoors. Which makes me think I may have a problem. The pattern has been provided for three differing lengths: 60, 75, and 90 inches. All sizes have a width of approximately 8.5 inches. The sample shown is the long version and can be wrapped and wrapped if you require a nest of cabled fabric around your face. If you're less about the drama, a shorter version can be worked without problem. The pattern is now available in my Ravelry Store here, and will be available through BrooklynTweed downloads shortly. Pattern instructions for this piece are charted. Thanks also to my dear friend Sara for modeling -- a Contemporary Italian Literature Scholar and truly fashionable Tuscan -- she wears knitting quite well, wouldn't you say? We shot these photos on location in a tower-filled, Medieval hilltown outside of Siena.